You are cordially invited to the SFEMS Garden in the Hills House Concert taking place on Sunday, May 19, from 1:30 to 4:00 p.m., at the home of Dr. Carol Baird and Alan Harper. This special party and concert will benefit the 2018 Berkeley Festival and Exhibition. 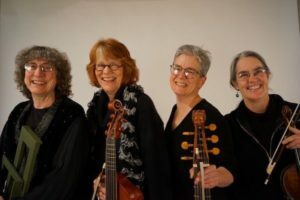 Music, The event features wine, hors d’oeuvres, and the Alphabet Baroque Club—Gwyneth Davis, viola da gamba; Judiyaba, treble viol and pardessus; Maria Caswell, violin; and Phebe Craig, harpsichord. The Alphabet Baroque Club is a lighthearted group that plays seriously beautiful music. Now internationally acclaimed since their appearance at the 2015 Galway (Ireland) Early Music Festival, the ABC performs regularly in the San Francisco Bay Area. The ABC uses historically accurate instruments to explore the music of the baroque in its own sonority, and also happily re-orchestrates pieces to fit the ensemble. The ABC is based in Sonoma County. Individual tickets to this event at $100 are available online. Make reservations now, as space is limited. If you have questions, please contact Jessica House Steward: jhousesteward@sfems.org. If you are unable to attend, consider supporting the 2018 Berkeley Festival & Exhibition by making a tax-deductible donation!